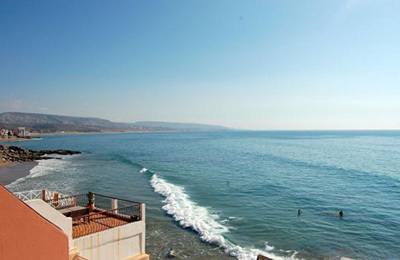 The Magic Bay Surf Camp - Imsouane, Agadir Guests overall rating: ★★★★★ 5 based on 4 reviews. Our surf camp is a cosy house located in the beautiful fishing village of Imsouane, on the beautiful Atlantic coast. At only one minute from the closest beach, a good break, and five minutes from the bay, our main surf spot. From our roof top, you could enjoy an amazing view of the beach, the village and the landscape around. Everybody is welcome at the camp for a maximum of 13 persons at the same time. We prefer to work with small groups to be more attentive to each person and make your experience better. We care about your surf progression and so we use photo analyse for a quicker improvement. Always mindful of a balanced and healthy alimentation, we can adapt to your diet whether you are a meat lover or vegetarian. He will make you discover the tasty flavors of the traditional moroccan cuisine! We are close from the heart of the village where you can do shopping, having drink in front of the sea, join some music party or going on internet. We will ensure you experience your holidays as you never thought possible. Perfect waves, Moroccan hospitality, year-round sunny weather, charming accommodation, exquisite home-cooked food and legendary surf memories await you here. You will be lodged in a sweet house close to the beach accessible by a one minute walk (for the closest one) and about five minutes to go to the bay. One with one double bed. Three of them have a private bathroom. Two of them have a nice balcony with view to the ocean. We have books, rooftop, TV, and a lounge for sharing moments together out of the water during relaxing time. The cook even grows his own vegetables in the garden of the outer courtyard. Ahmed is truly the best chef cook ever! You cannot resist his delicious meals: tajine, couscous and more… Graduated from Agadir Cooking School, with years of experience, Ahmed cooks for you with his heart! He likes to go himself in the souk/market to choose fresh products, vegetables and fruits in season. Always mindful of a balanced and healthy alimentation, he can adapt to your diet whether you are a meat lover or vegetarian. He will make you discover the tasty flavors of the traditional moroccan cuisine! 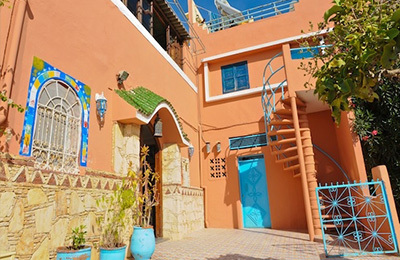 Traditional and charming accommodation right in front of the ocean with a view and direct access to Banana Beach (14km from Agadir). Nice rooms, bathroom, a private terrace in each one and a collective garden to relax in whilst listening to the sound of the waves between the sessions. Simple pure atmosphere! You will be staying approx a half of your time in Banana House and approx a half of your stay you will be located in Imsouane Surf Camp. Surfing is our main activity, all our teachers are certified surf monitors and passionate surfers, they are with you in the water. We can do up to three sessions a day depending on the tides and conditions. So, when it’s good we are in! We provide you all you need (board, wetsuit, wax, etc. ), but of course, if you want to surf with your own material you are free to bring it. Your instructors will give you advices and surfboard adapted to your individual level for a better progression. When we go surfing at the magic bay, we take all the surf material with the car and you are free to join us at the beach choosing if you prefer to walk or to go with us by car. Nice reef break left wave which allows the intermediate surfers to exploit the wave with a few maneuvers. It can dig with medium swell and form cool little barrels. Amazing for sunset session! Working in nice swell, this powerful right and lefthand wave offers possibilities of nice ride in the line-up. Accessible for all level. If you choose to practice stand up paddle, you will learn with Youssef, a waterman who do SUP for many years, on our Indiana Stand up Paddles. First of all, you will learn how to stand up, find and keep your stability on the board and paddle on flat water. Imsouane is one of the best spot to learn how to do SUP thanks to the tides, no wave when it is high and a huge space when the waves are breaking. You can do what you want, riding waves if you feel comfortable enough, or hanging around on the flat water and enjoying the unbelievable background of the Imsouane bay. You could enjoy and make your SUP surfing better thanks to the advices given by professional monitor, on our amazing waves of the Bay, the Cathedral (more powerful) and the Reef (for advanced surfers). You understood that Imsouane is a magic place for Stand up Paddle. We also organise Yoga/Surf weeks. You could practice Yoga every day of the week with a professional teacher. And the rest of the time, you will go surfing, skating, hanging around and more. You will combine Surf and Yoga, two different spirituals and complementary sports. Think and learn on you, then you could push your limits further. Sometime mother nature don’t want to provide us good enough conditions for water sport, so you can go skating all around the village to keep you in form and train your surfing moves. We could also organize cultural excursion like visiting the Agadir Souk, walk on beautiful Moroccans’ backgrounds, meeting local people in small villages around, and more. We have some surf movies to show you, if surfing is not possible. Enjoy of a beautiful stand up paddle boardwalk at the bay. You could initiate yourself with ocean fishing or practice snorkeling. Our surf camp is a cosy house located in the beautiful fishing village of Imsouane, on the beautiful Atlantic coast. At only two minutes from the closest beach, a good break, and five minutes from the bay, our main surf spot. From our roof top, you could enjoy an amazing view of the beach, the village and the landscape around. The surf camp is located in between Essaouira and Agadir (the region has a microclimate which includes an average of 330 days of sunshine per year). A very calm and typical fishing village full of charm. All bar, restaurants, shops and more are reachable by foot. 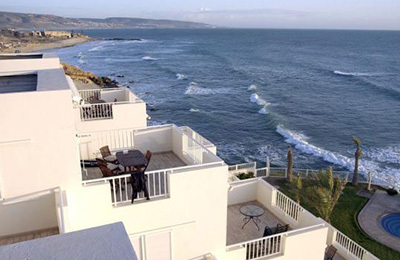 The surf lodge is close to the bay, one of the famous right hand of 800 meters long in Morocco. The other spot close from the camp is Cathedral, a very good beach break for all level. We can also go to Taghazout when the conditions permitted it. Here we surf the famous Anchor Point, la Source, Banana Point and more amazing waves. Most of the passports can enter morocco without a visa for a period up to 90 days. More information here: https://morocco.visahq.com/ . To come to the camp the best option is to land at the Agadir or Essaouira international airport. Ryanair and Easyjet have convenient and cheap flight from London. If you come from Marrakech airport, you can easily reach Agadir or Essaouira city by bus, from where we also organise your transfer to the camp. Our taxi will drive you directly at the surf house. Transfer is about 2h and is included in the package. You can also come here on your own, we have places to park cars, bike, motorbike, plan, bus, truck or whatever you have in front of the Surf camp. For all those who aspire to discover the Moroccan surf, with safety and peace of mind. As a beginner or intermediate surfer, you want to progress quickly, improve your technique and style on your board. Learn from our pedagogic surf teacher, discover the local surf culture, some beautiful landscapes, enjoy the sun throughout the year and the fresh fish from the local harbor. You will be staying in the village of Imsouane, where you will delight the delicious home-made food of our chef Ahmed and ride the magic wave of the bay. Be ready, this adventure could change your life! Surf lover and travel addict? This package is made for you! You’ll have the best surf during your stay, at the right time and in the best places. You will discover the potential of the south coast spots of Morocco, from sunrise to sunset. Your guide will find the conditions adapted to your level (beginner, intermediate or advanced). Be ready to experience plenty of different spots. You will even try the famous ones: the legendary Anchor Point, Dracula, Banana, Imsouane, etc. You’ll share your sessions with an experienced local waterman who ensures security during your practice and makes you feel like a local. You will be staying between Tamraght and Imsouane where you will enjoy the delicious healthy Moroccan food. Home is where the waves are! Surf trip lover, get your backpack ready! “Morocco Surf Trip” is a package for the adventurer that is hiding inside each and every one of you. From Tamraght, you will travel along the coastline with the region’s best surf guide to discover wild landscapes and empty spots “searching for the waves!” Southbound : Mirleft, Legzira beach with the beautiful red arch, Sidi Ifni. Northbound : Imsouane, Tafdna, Iften, La grotte, Sidi Kaouki, Essaouira. You will be staying in different hostels and you may taste the best tajines and couscous of your life. Yallah, let’s explore the ocean! During our Yoga Surf Retreat Imsouane, celebrate life through the practice of yoga and learning to surf in a breathtaking place in nature. These vacations are designed to enjoy a delicious time cultivating body and spirit and your relationship with the ocean and nature in general. Mix and match to create a stay that suits perfectly for you. Let us show you great waves in incredible landscapes, but also the true Moroccan way of life. "The surf camp is situated in very very very nice and calm fishing village in Imssouane. Campers stay in one house, so during your holidays you get to know all the people and camp stuff in the house. As you surf in the same area, after morning surf sesion you can go back to the house to rest, have shower and lunch or sometimes have fresh fish just in the beach, which is very nice experience :) Surf teacher Youness is super optimistic and encouraging person. You can learn from him not just about surfing, but about enjoying life. You get a lot of attention and care, cause camp acomodates small groups. Surf camp owner Youssef is always there to talk, to energise, to share stories and life in Morocco, very friendly person and suprisingly full of energy and full of crazy surfing ideas :) And his wife Elsa is always ready to help you organise all the trip details :) Last, but very important thing is food, chef Ahmed makes very tasty food, true feast for your stomach :) So, if you want to have relaxing surf holidays in nice place with nice people, it's the right choise :D"
"It was my first time in Morocco and i had a fantastic stay. The whole team is just unbeatable. The food, surf equipment, lessons, teacher, landscape, house, atmosphere... We had great fun all together, and I could really improve my surf skills. I will definitely come back, as soon as possible! : )"
"It was a great fun! The guys hosts are really awesome with a good sense of humor! They are not only good surf teachers helping your to cope with the ocean and the waves not only words (detailed and clear explanations), but on the fact (in the water and on sand) They are also very welcoming, friendly and attentive people to all your needs. The conditions of living are perfect: cozy and clean (hot water included with a good pressure). Meals 3 times a day thanks to the cook (everything was delicious). If you are late for breakfast or lunch you can easily ask the cook to give you smth to eat, he is permanently on duty." 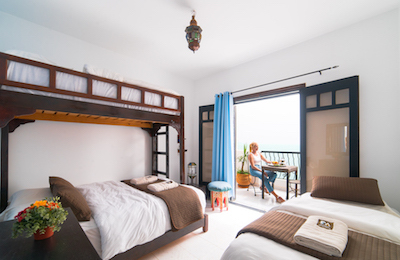 "it was our first stay in marocco and it was awesome! the landscape is breathtaking and the locals are very friendly!! we stayed 4 days in Imssouane and 3 days in Taghazout! both places were perfect!! the food was excellent and the team was so funny and we had a really good time!! we could feel their surfpassion and by the end of the week we had the passion for surfing too! it was a pleasure to be their!"